As I crouch beside the toilet, glancing awkwardly from one firefighter to another, I wonder: How did a person like me, who doesn’t even like cats, and who is far too unattractive for selfies, end up in this predicament? Let’s rewind to the beginning of this week. Our four-year-old son loves cats. 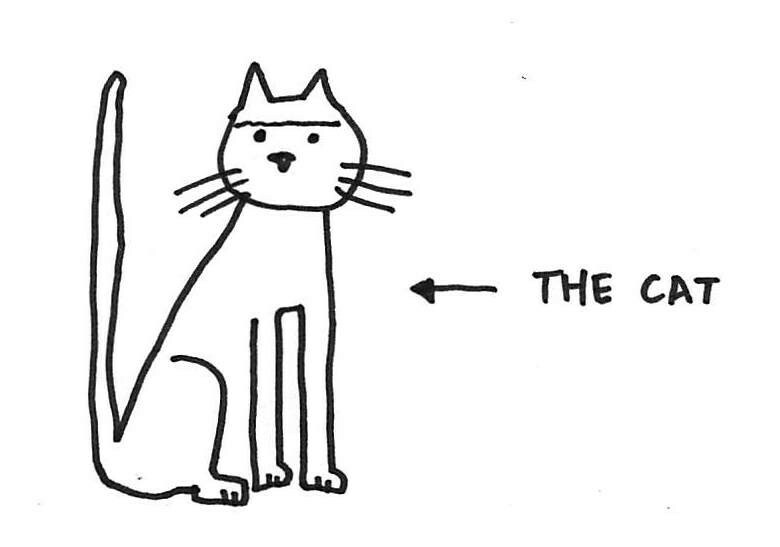 Now, you might consider yourself a cat person. Perhaps you even have a mug with a picture of a cat on it. That is nothing. Our son has dressed up as a cat every day for one year. Every morning of 2015, he put on a headband with cat ears and we attached a tail to his shorts with a safety pin. Every morning, for what amounts to 25% of his entire life. He’s really into cats. After months of discussion, we decided to adopt a cat. I am not a cat person, and my wife is not a cat person, but we have a duty as parents. So we visit a few shelters. And on Monday, we find a winner: a super friendly cat with gray and black fur. We get the cat home. It leaps out of its cardboard carrier and struts. It is confident and completely at ease. Clearly, it has no need for a safe haven. We have wisely selected a badass cat, and we are not so naive as to follow every rule without question. We let the cat out of its room and we go to bed. In the morning, this is amusing: What crazy place did that crazy cat decide to sleep? We can’t wait to find out. By lunch, we have explored every conceivable cat-sleeping-place in our home. No cat. By evening, we begin to freak out. Then my twelve-year-old son discovers a tiny opening in the corner of our tiny bathroom. Beyond is the underside of the tub. Even with a flashlight, we can’t see the whole space. Certainly, the cat is hiding around the corner beneath the tub. Certainly, it will come out when it is ready. We place some cat food outside the hole, leave it alone, and go to bed. The first sign of the cat comes in the morning. We hear meows, and they are most definitely coming from beneath the bathtub/toilet area. In a moment of brilliance which almost redeems us for letting the cat out in the first place, we purchase the aforementioned selfie stick. It works great. I set my iPhone to video and turn on the flash spotlight. Then I record as I extend the selfie stick into the abyss beneath the tub. Watching the video is like watching the footage from the submarine that explored the wreck of the Titanic, because the beam of light exposes an unknown world concealed in the murk. Also, neither film ends with the discovery of a cat. My twelve-year-old son and I use a crowbar to smash the tile outside the bathtub. There is no cat inside. 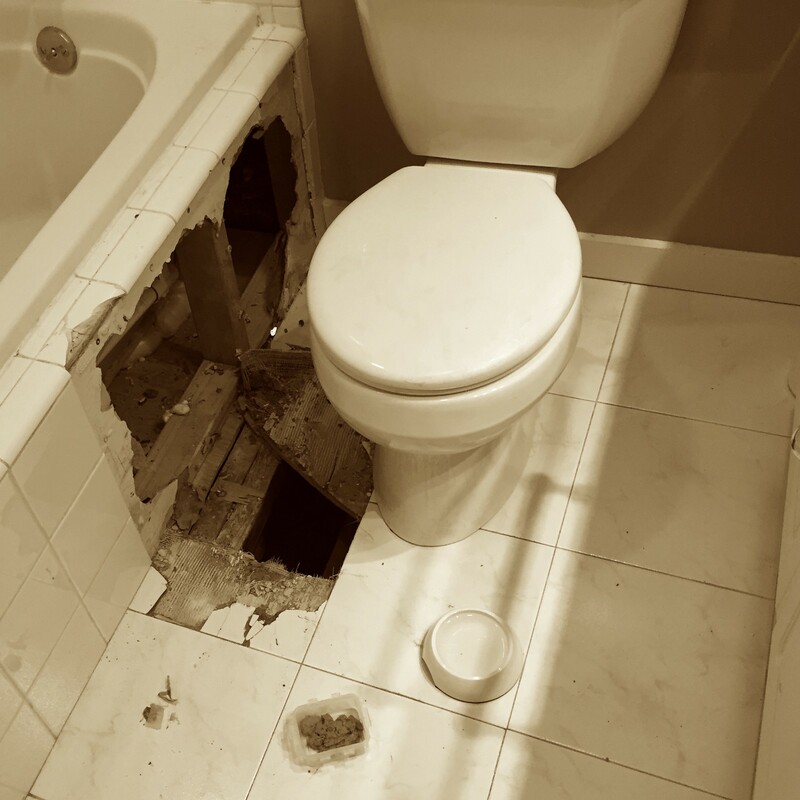 There is, however, another hole beneath the tub that leads to the subfloor. Using the selfie stick, we can see a whole new labyrinth of dark passageways. It is cat Disneyland down there. 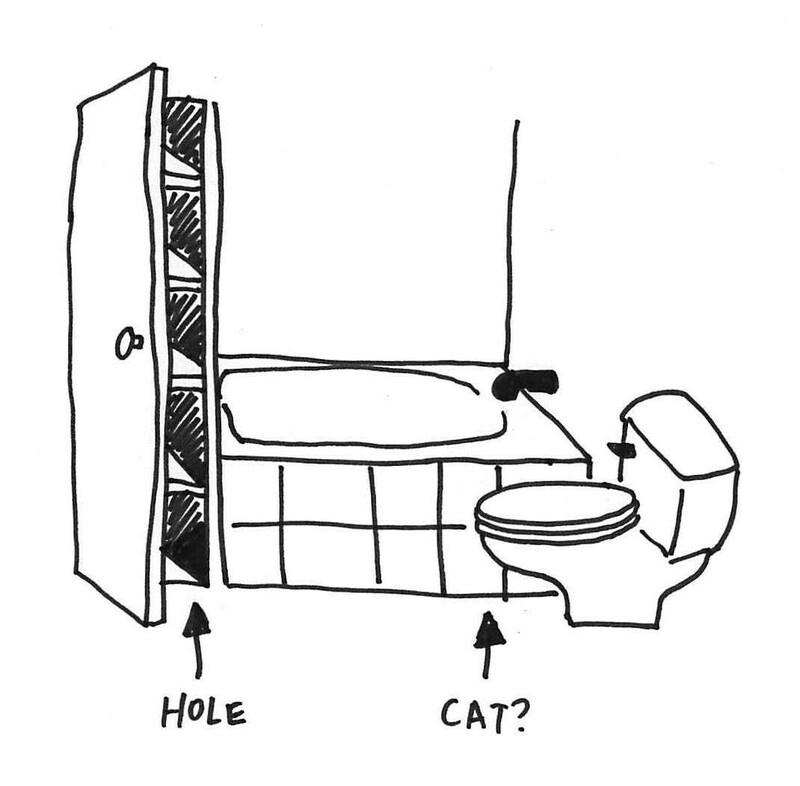 I do some web searches for “cat subfloor.” Most of the results are about cat urine, which leads me to unhappy thoughts. The only remotely relevant experiences are on Yahoo Answers. Then I realize I’m reading Yahoo Answers about cats. My God, what has happened to me? We move the cat food near the new hole in the bathtub. We add a can of tuna and some bonita flakes. It smells super fishy. The cat should be pumped. We also put on some soothing classical music (Claire de Lune) and set it to repeat. We shut the door. Certainly, the cat will come out during the night, when the house is quiet. We go to bed. The meows are hoarse. The sound is maddeningly close to the hole. We are now convinced that the cat is stuck. It has been over 72 hours. We call Animal Control. The guy shows up right away. He’s exceptionally nice. His own cat once hid for five days, but he shares our apprehension that our cat may be stuck. He calls the fire department. A proper truck with a ladder pulls to a stop outside. Six firefighters file inside our home. The fire chief has a special tool for detecting heat through walls, but she can’t find the cat. “We could cut a hole,” she says. I feel like an idiot asking the fire department to do something as trivial as cut a cat out of the floor. Especially on New Year’s Day. “Don’t worry,” says the chief. “It’s good practice.” She sets two rookies to work with a pickaxe and a Sawzall. One of the veteran firefighters tells me that you can take down an entire building with a Sawzall, or cut a car in half. Still, it takes about fifteen minutes to get through the tile and wood. The firefighters proceed carefully, so as not to cut the cat in half. The hole is finished. The meows have stopped, possibly because of the pickaxe-ing and Sawzall-ing, which — you may be surprised to learn — was pretty loud. The firefighters gather round. I get down on the floor and use the selfie stick and iPhone to peer under the tile. Below the toilet is a long corridor of subfloor. It’s shaped like a trough, thanks to the peculiar shape of the old lathe-and-plaster ceilings that converge below. Also, the space is divided by wooden joists so that it is impossible to see all the way to its end. No sign of the cat. We thank the firefighters. They pack up and drive away. The Animal Control guy drives away. All we can do now is wait for the cat to emerge. We are worried. I am worried. Of course, I am generally worried about the cat’s well being. I am also very specifically worried that if the cat dies in there, my wife and children are going to be super sad AND it is going to smell super gross. We scramble to the bathroom door, then tiptoe in. The meows are still coming from the same place. Right below the hole. Wordlessly my twelve-year-old son passes me the selfie stick. I look beneath the floor. The meows continue. They’re coming from right there but there’s no cat. Maybe the cat is buried. I plunge my hand into the subfloor, pulling out handfuls of broken plaster, cement board, wood, and tile. Nothing. But wait. What is that dark hole back there by the wall?! I turn on the flash spotlight and send the phone into the abyss. There is nothing but darkness. I wait five seconds, ten. I’m just about to give up when two tiny gleaming lamps shine back. The creature fell into the narrow gap between drywall and studs. At least twelve feet down, all the way to the floor below. We race downstairs. My son hands me the sledgehammer. I punch a small hole in the drywall, just big enough for the phone. I pull back the hammer to take another swing. Then I freeze. The cat’s head pokes through the opening. It doesn’t matter. I don’t care that the cat is a jerk. My twelve-year-old son is happy. My four-year-old son is happy. My wife is happy. And, okay, I am happy, too. We took the cat to the vet hospital right away. It was dehydrated and hungry, but otherwise fine. So we took it home and put it in its safe haven. This time, we shut the door. If you liked this story, consider buying my book Sprint. It has nothing to do with cats, but, purely by coincidence, it is about how to solve big problems in just five days. Sprint will be available in hardcover, e-book, and audiobook on March 8. You can buy it here.